Doug and Porkchop with the logo. Doug was an animated series that premiered on Nickelodeon in 1991 and ran until 1994. It was then produced by Disney for the ABC Network from 1996 to 1999, being dubbed Brand Spanking New Doug (later changed to Disney's Doug). Out of the 65 "lost episodes," only eight episodes of Disney's Doug were released on VHS, plus Doug's 1st Movie. The majority of the episodes can be found on Kimcartoon and MEGA. However, some are still missing, including several Quailman episodes. The entire series can also be downloaded in its Greek dub as well. Some of these have yet to be found in their original English dub, however. 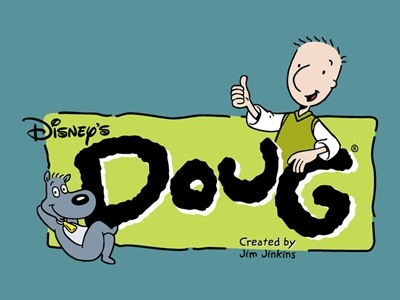 ↑ Majority of the Disney's Doug episodes on Kimcartoon. ↑ Most of the found episodes from the show. ↑ Joshua Maldondo's YouTube channel, where he has uploaded some of the other missing episodes. ↑ A MEGA link to the full series (in Greek).